“I should really write a memoir some day.” Have you ever said that? Many people tell me this when they read my memoir. Most of us seldom write anything longer than a five sentence email or a ten word comment on someone’s Facebook page, and then suddenly we’re thinking about writing our life story. Other people have played with the idea of writing for a long time. Whether we are still in our thirties or into our sixties and retired, the idea calls to us. Maybe, like me, you’ve just been through nursing someone through their final illness, and you feel like you are going to burst with all you’ve been through. How that last afternoon you spent with your brother, eating ice-cream and listening to Stevie Wonder stretched, out like a glorious bouquet. Or the rainy October afternoon when your mother lay back on her pillow and told you about the pony she had when she was a girl in Slovakia, before she came to the United States. “I had a pony once,” she says. “I never told you about my pony.” She slips into Slovak and doesn’t know it. Her wan face lights up with that last day with the pony and her hand moves faintly, brushing it and feeding it an apple. “So sweet,” she murmurs over and over, her eyes closed, a smile on her lips. Or you want to tell everyone about the day back in 1973 when your newborn baby wouldn’t stop crying. Your husband has gone back to work and you and the baby are alone for the first time. You pick the baby up and walk from the nursery into the living area, do a loop around the kitchen table, bathrobe sash dragging through the crumb-littered floor, and you look down and see her little face finally relaxing into sleep. Little half sobs, then quiet, slow breaths. You keep pacing slowly around the apartment, afraid to stop, almost asleep on your feet, until you are crying softly with a mixture of love and exhaustion. A neighbor women you don’t know very well knocks on the door and insists on holding the baby while you take your first hot shower in two or three days. When you emerge from the steamy bathroom, the baby is asleep in the bassinet, and your new friend has swept the kitchen and made a pot of coffee. That story needs to be told, you have said many times. I love that woman. The time your purse was stolen while you were asleep on a train in Germany and the old couple in the American Express office insisted on loaning you some money. The summer you were a camp counselor and that tall, dark-eyed older boy tried to force you and you almost agreed. That horrible, sexist boss you had. The stories are good. Now to transform them into a good memoir. For this we need to merge them with another tradition, that of the diary or personal journal. Like Anne Frank, we sometimes feel the urge to pour out our souls on paper, thrashing through the disappointments and confusions of daily life with a twist–not just reciting the facts, but considering how it makes us feel. We wonder, pen in hand, how to make sense of the non-sensical. We relive the unfulfilled longing, the fear of death, the anguish of loss. Special moments call to us, and we return to them in our heads, finding solace, anger or melancholy in our repeated visits. And this is what makes a memoir worth the incredible hours and hours of work to write and rewrite: finding that special story arc that zings, that blend of incident and truth-telling, humanity and spirituality. A group of anecdotes may just sit there. But when they distill a story of growth and change, when your heart and soul bleed onto the page along with a compelling narrative, that’s a story worth telling. When you find this story, keep writing. Katherine Flannery Dering earned an MFA from Manhattanville College in 2012 and also holds an MA in Spanish Literature from SUNY at Buffalo and a BA from Le Moyne College, in Syracuse, New York, as well as an MBA from the U of Minnesota at Duluth. 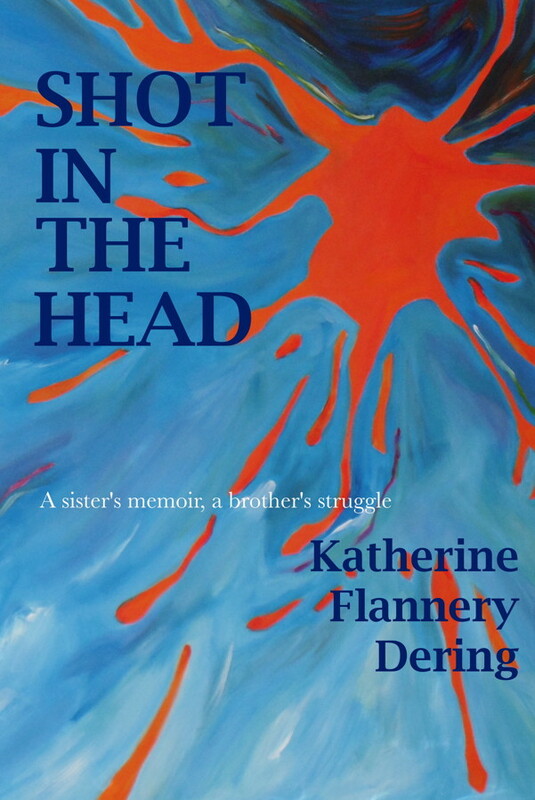 Her memoir, Shot in the Head, a Sister’s Memoir, a Brother’s Struggle,” was published in 2014, and is available on Amazon ( http://tinyurl.com/pakb5ga ) and at Barnes & Noble ( http://tinyurl.com/mkdnh5o ). She is working on some new stories in her book currently in progress.